2 × nine = Required Please enter the correct value. U.S. oil production is up 3% since OPEC struck a deal to cut its oil output on Nov. 30. But some observers doubt U.S. production growth can continue. At the World Economic Forum in Davos last week (Jan. 17), Saudi Arabian Oil Minister Khalid Al-Falih said he doesn't think U.S. oil producers can keep up recent production gains. "What has been tapped recently is the most prolific areas," said Al-Filah. "As demand rises, [U.S. oil producers] will go to the more expensive, more difficult, less prolific areas in the shale and they will find that they need higher prices." But again, Al-Filah is wrong. Since OPEC announced its production cut on Nov. 30, WTI crude oil prices are up 13%. Those rising oil prices have encouraged American oil companies to scale up oil production. When oil prices rise, the oil being pumped is more valuable. But some methods of producing oil are more costly than others. That means oil needs to be more expensive for these methods to be profitable. And getting oil out of the ground can be difficult depending on where the oil is. Shale oil, or tight oil, is found in rock or sandstone instead of in underground reservoirs. That means shale oil is more difficult to produce because it must be extracted from the rock through a chemical process, like pyrolysis or hydrogenation. Because that is more complex, shale oil costs more to produce. As recently as 2014, the price of oil had to be above $60 a barrel for tight oil producers to profit. The EIA estimates that 52% of American crude oil came from tight oil. That's why Al-Filah says U.S. oil production will stop growing. Al-Filah says extracting more shale oil will be too expensive for American companies at oil's current price, and shale oil production will fall. Al-Filah's comments ignore recent gains in American oil company efficiency. Oil producers have rapidly reduced the breakeven price for tight oil. "Improvements in field operations and efficiency have lowered well-head operating expenses," according to Money Morning Global Energy Strategist Dr. Kent Moors. In fact, shale oil's breakeven price has declined by as much as 60% between 2013 and 2016. 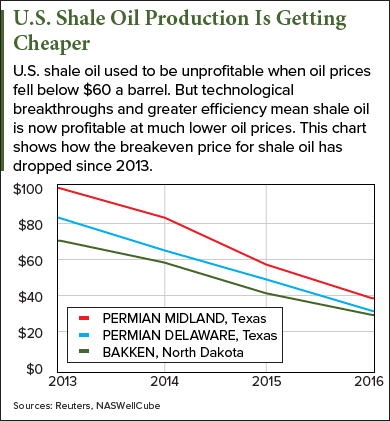 As the breakeven price drops, shale oil will remain profitable even if OPEC's production cut agreement fails to keep prices up. That's why Saudi Arabia (and OPEC) is worried and why American oil producers are not. You see, in 2014, the Saudis tried to end the American shale oil business. The Saudis produced more oil to drive oil prices down. Oil prices would eventually fall to $35.79 a barrel in 2016 from over $90 a barrel in 2014. By driving down oil prices, the Saudis had hoped American oil producers wouldn't be able to make a profit on shale oil and go out of business. But that's not what happened. Tight oil producers got more innovative instead. "Saudi Arabia gambled that the cuts could drain excess inventories before shale production ramps up and starts adding extra barrels to the global supply picture," Reuters reported on Jan. 23. But the Baker Hughes rig count showed the United States added 35 drilling rigs last week (Jan. 20), its biggest jump in rigs in five years. The EIA released its weekly update of U.S. crude oil production today (Jan. 25). The latest figures show the U.S. increased its oil production last week by 0.2%, and by 2.2% since the start of the year. Even Big Oil companies are scrambling to get into tight oil. Last week (Jan. 17), Exxon Mobil Corp. (NYSE: XOM) announced a purchase of $5.6 billion worth of oil companies in the Permian Basin, doubling its holdings there. Now that oil prices are rising again, "everyone is looking at U.S. shale producers now," says Moors. "And that means 2017 is going to be a great year for energy investors."